Having a child can be one of the greatest gifts in life; however, pregnancy and child-rearing can take a toll on your appearance that may be difficult for you to reverse on your own. It’s very common for new mothers to experience stubborn excess fat in a variety of body areas that doesn’t respond to diet and exercise. It’s also common for the breasts to be affected by excess skin and/or lost volume, and the stomach area to exhibit extra skin and fat that is very difficult to get rid of. Here at the practice of Dr. Daniel C. Mills, our plastic surgeon certified by the American Board of Plastic Surgery, offers a procedure called the Mommy Makeover – designed to incorporate one or more cosmetic enhancement treatments that address a number of aesthetic issues. A Mommy Makeover can restore your body to its pre-pregnancy figure and enhance your self-esteem. After all, motherhood involves a lot of sacrifices, but the way you look does not have to be one of them! If you would like to meet with Dr. Mills to discuss your specific concerns, please contact our practice to schedule your Mommy Makeover consultation. During your initial consultation with Dr. Mills, he will go over the many treatment options that can be included in a Mommy Makeover, and come up with an overall plan for your procedure. You can discuss with him your goals, and decide on how you would like your Mommy Makeover procedure performed – either in one combination of procedures, or a number of procedures staged at different times. Dr. Mills will answer all of your questions and help you decide which treatment options are best for your needs. Sagginess and excess skin in the breasts are one of the most common effects of pregnancy, and can become even more noticeable after breast-feeding. Breast lift, or Mastopexy surgery, is a procedure designed to eliminate excess skin and lift the breasts to a higher position. This effective treatment can give your breasts a firmer, “perky” appearance. For women who have lost breast volume after pregnancy, in addition to experiencing sag or droop in the breasts, a breast lift with implants can provide beautiful results. This procedure is designed to tighten the breast skin and add volume and fullness to the breasts with breast implants. A breast lift with implants can allow Dr. Mills to give you a more youthful and sensual breast contour. Breast augmentation can be of great benefit to women who would like to increase the size of their breasts and enhance their bustline. Dr. Mills offers an array of implant sizes, shapes, and types, including the innovative Gummy Bear breast implants. He can also perform this procedure using minimal incisions and no scarring on the breast. One of the most popular surgical aesthetic enhancement procedures, liposuction can eliminate pockets of stubborn excess fat virtually anywhere on the body. After pregnancy, you may notice areas retaining fat that are extremely difficult to get rid of through diet and exercise alone. Liposuction targets these areas and removes the extra fat for a more contoured appearance. For patients who may not need a full liposuction procedure, CoolSculpting® offers a non-surgical alternative that can reduce excess fat in isolated areas of the body. This advanced treatment involves no needles or anesthesia. CoolSculpting® utilizes an innovative cooling technique to target excess fat cells without harming surrounding tissues. The body can then gradually filter out the excess fat through natural metabolic processes. This state-of-the-art treatment can be used in a number of body areas. Tummy tuck (abdominoplasty) surgery addresses the area most affected by pregnancy: the abdomen. During pregnancy, the abdominal muscles are stretched and pulled apart, and it can be difficult to get rid of the excess skin that appears in the midsection. A tummy tuck pulls the abdominal muscles taut, eliminates extra skin, and tightens the remainder for a flatter, more fit-looking stomach. After pregnancy and during child-rearing, areas of your face may take on a tired or aged appearance, making you look older than you really are. A number of cosmetic injectable facial rejuvenation treatments, such as BOTOX® Cosmetic or dermal fillers like JUVÉDERM®, can reduce the appearance of fine lines, wrinkles, and crow’s feet for a more refreshed and youthful appearance. Recovery from Mommy Makeover procedures will depend on the type of procedures you have and how many are performed. With more invasive procedures like tummy tuck surgery or breast lift, you can expect at least several weeks of recovery time. If you opt for only one or two Mommy Makeover procedures, or non-invasive treatments like cosmetic injectable facial rejuvenation, you may experience a shorter recovery period. A Mommy Makeover can do wonders for enhancing your appearance after pregnancy, restoring your body and helping you feel better about the way you look. Please contact our practice for more information on Mommy Makeover procedures. 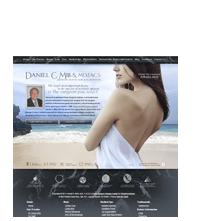 If you would like more information on breast enhancement, body contouring, facial rejuvenation, and the many other treatments available from Dr. Mills, please visit our main website at www.danmillsmd.com.